Newly updated for 2019 with all the new laws and taxes. They say its one of the most stressful things in life, and it shouldn’t be! Buying a property is bad enough when you speak the language and understand the system. 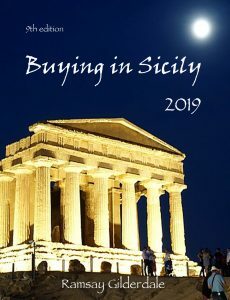 Very few people know just how tricky buying property in Italy can be. There are loads of books, mainly about people who have been through the process once or twice and want to pay for their restorations by telling others how to do it. Unfortunately, it’s no guide to being accurate. Add to this the perennially changing law in Italy, and you need a book that isnt out of date by the time you reach the cashier. That’s where Buying in Italy fills the gap. 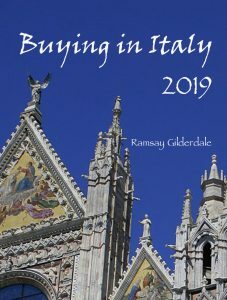 Written by a professional, and updated free of charge for two years after you buy it, you will be able to keep abreast of the changes in the Italian property market, and have a sound grasp of the system. Visure, Catasto, Underdeclaration, Destinazione Urbanistica, Planning law, Dealing with estate agents, Illegal agents, Your rights, Buying to restore, Buying to build, Buying off plan, New build, Vincoli, The compromesso, the act of rogito, Notaios, Geometras, Architects, Prelazione, transcription, Caparra, Useful sites, Bank accounts, codice fiscale, Sicily, Prima Casa, Residence, in short – everything you need to know about buying in Italy. Buying a property abroad can be difficult. It is always best to use a legal, experienced estate agent when buying in Italy. In the south, especially, there are many people operating illegally, who cannot offer the expertise and knowledge of a legal estate agent. We cannot emphasise enough the inherent dangers of buying through an illegal agent – from fines to ending up without a house you have paid for. Just because a website is in English does not mean that they are selling property legally. If you want to buy a house or buy a property in Italy, the most important choice you make is who you buy through. A consultant, a property specialist, or a buyers agent is not a legally operating estate agency and is not recognised by Italian law.